Add a touch of mid-century modern or boho chic style to your home with easy crochet patterns. From walls to floors, we have you covered! Boho chic décor is right on trend, and crochet accessories are a big part of the look. Contemporary yet timeless, the blend of textile textures with mod and ethnic motifs makes this home décor style one anyone can warm up to. From afghans and rugs to wall hangings and pillows, it’s easy to create your own crochet projects that bring modern design to your home. And what’s better than surrounding yourself with handmade home accents you can display and enjoy with pride? Here at I Like Crochet, we’ve yet to meet a modern home décor pattern we didn’t like. But we definitely have our favorites and we’ve collected five standouts just for you in our Modern Crochet Home Decor Collection, starting with the Waverly Throw. With its bold geometric blocks of color, this throw makes a statement that complements most any décor. At 50” by 56”, the Waverly Throw is the perfect size. It looks just as beautiful draped on the end of a sofa as it does wrapped around you, snuggled up by the fire or enjoying a book on the porch swing. 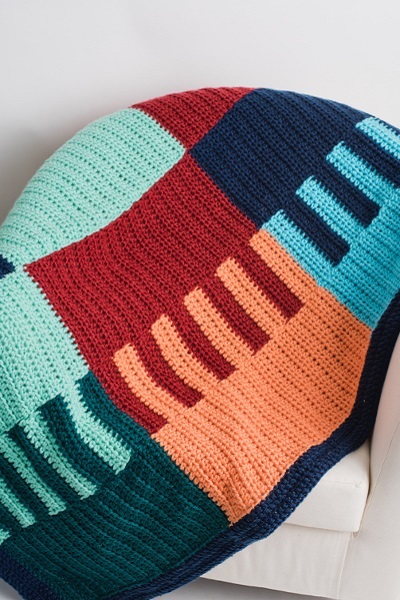 The Waverly Throw pattern is quick and easy to make using bulky yarn. And, you’ll love this: the throw is worked in panels, so there’s no need to change colors mid row — just stitch the panels together to create moving lanes of color. The pattern adapts to any color way: choose brights to cheer you, neutrals for a study, or pastels for a warm-weather look. There are so many combinations to try—you’ll want to make this throw pattern again and again. But the Waverly Throw is just one of the wonderful modern home décor patterns we want to tell you about. Crochet modern home décor designs to reflect your style in every room. 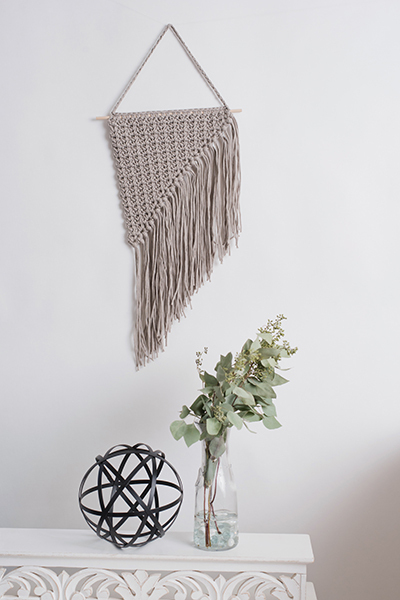 ‘Weave’ a wall hanging in no time with the spider stitch and this easy pattern. The Callista Wall Hanging fits in anywhere—your entry, office, dorm room, or any place you want to add a handmade boho chic accent. This pattern takes just one ball of bulky yarn and measures 12” to 29” at its longest point. The Callista Wall Hanging is the perfect beginner project because it’s easy and quick, worked primarily in single crochet and increases. Make it in a neutral color for a macramé look or choose a hue that really pops. Then, display your home décor piece proudly! 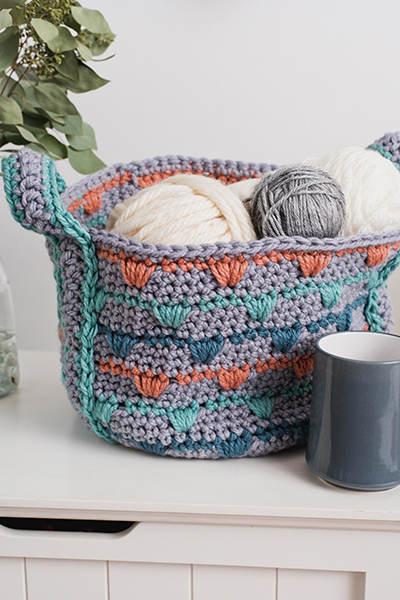 Baskets make attractive organizers, and you can never have too many—especially when you can crochet a beauty like the Emerson V Stitch Basket. This design uses heavy yarn and a thick stitch to make a sturdy, but collapsible basket. The one-piece handle adds extra support to the bottom and sides. The pattern is worked in single crochet and the spike V stitch. Imagine this basket nestled on a table or bench attractively containing magazines or your yarn skeins. What a wonderful gift this crochet project would make, stuffed with new baby needs or spa bath supplies. Perfect! Explore home décor patterns for every taste and skill level! 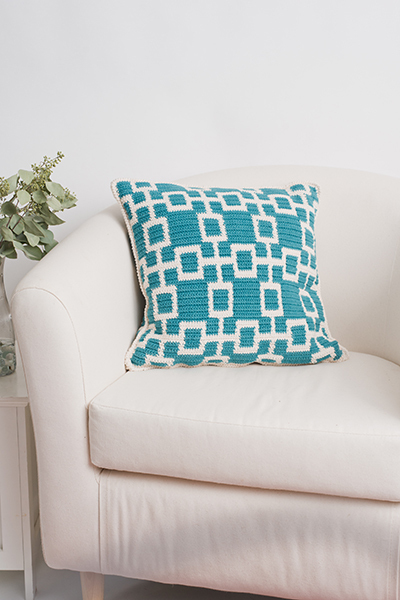 Bring a mid-century modern vibe to your home with the Mod Trellis Pillow pattern. The striking design measures 18” square and features a simple two-color, 22-stitch motif repeat to create an interlocking squares pattern. Both colors of yarn are carried throughout the work, making color changes easy with only two ends to weave in. The pattern is worked in reverse single crochet, or crab stitch, and we include an easy-to-follow stitch chart so the design comes out perfectly. Place the completed pillow on a bed or chair to give any room an instant update. It’s like a work of art! Stripes go with everything. And that means the cushy and quick-to-make Isla Rug fits effortlessly into any room. 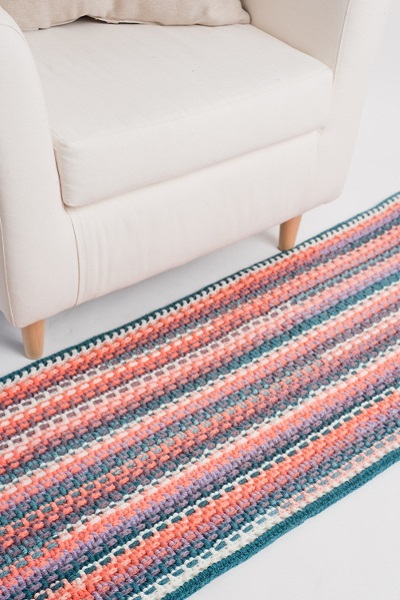 The pattern is worked in a tripled 3-weight yarn in extended half double crochet and foundation half double crochet, making the rug look woven and feel oh-so-cozy underfoot. Measuring 20” x 64”, the Isla Rug fits perfectly alongside a bed or in front of a loveseat. The stripes bring a graphic, yet warming, touch to modern décor wherever you place it, so feel free to make more than one. With these five versatile scarf patterns, you’ll always have a project—and an accessory—to enjoy any time of the year. Gather your yarn and crochet hooks and get ready to have fun adding your personality to each one of these wardrobe enhancing scarves. You’ll find this collection in the I Like Crochet Collections Club. And, did you know you can have access to it anywhere you go? Just become a Gold Club Member, and you’ll be able to view this charming collection on your desktop, laptop or tablet – whichever device you prefer!